Whether you’re looking for a luxurious stay, a budget holiday or an adventurous break, in all cases Morocco should be high on your bucket-list. Although it’s only a short fly away from Europe, you’ll find yourself in a totally different culture, a place where African beats and Arabian atmosphere come together. Jemaa el-Fnaa, the vibrant market-place in Marrakesh. Thirsty while visiting Jemaa el-Fna? These guys are happy to sell you some water (drink at your own risk). Don’t like snakes but I did felt sorry for them. At night the square fills with food stalls. And they serve a tasteful variety of local dishes. On your way from Marrakech to the Sahara you’ll bump into the ksar (fortified city) Aït Benhaddou. It’s a Unesco World Heritage Site and the location where many films and series (Games of Thrones!) have been shot. Scenes from the road. Another movie location. …And another one. There are hundreds of kasbahs and ksour (fortified villages) to discover in the south of Morocco. The desert is getting closer. Our place to sleep. It was more comfortable than it looks. In Zagora. Timbuktu is 52 days away. What do you think? Must go or no? Your photos are AMAZING! Inspiration enough to want to visit Morocco. Gorgeous pictures! Your pictures have definitely made me want to add Morocco to my list! Stunning photos, Morocco is one of those places I am never sure if I really want to go but seeing photos reminds I need to go, if only to enjoy the richness of the colours and culture. Tx for the visit Michele. I had the same feeling: not sure if it would like Morocco. But: it’s a very diverse country, and the nature is stunning. I’m sure you will love it. I love how it looks as if the desert could just completely overtake the roads, if it were left alone for a few years. this is not what i had imaged Morocco to be like – its really nice! Thanks for the visit Sam. I really want to go to Morocco! Go! 🙂 It’s such an easy country to visit, people are very welcoming and the nature and cities are amazing. Beautiful pictures here, a really awesome collection! I love the camel shot heading into the Sahara – a true unknown quantity in the world for sure. I love how you have included so much color into these images. Tx for your comment Chris! Nice selection. I really like the fourth pic from the bottom, a nice composition. Your photos show a place that is not only beautiful, but is filled with life! We are really looking forward to going to Morocco one day! Thanks for the visit Gabor. Must go! 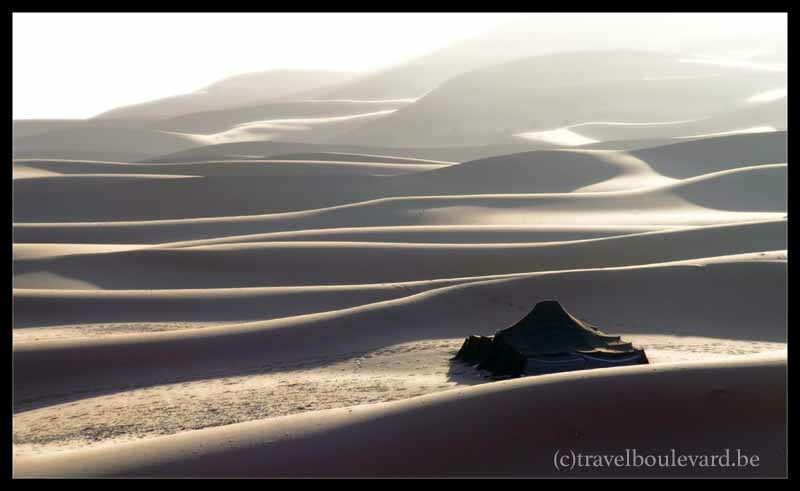 I want to see it for sure – and to sleep in the dessert would be an amazing experience! Thanks for sharing the photos -they are lovely! And so cool you got to see a location from Game of Thrones (love that series!). You really captured some gorgeous photos. Love “Scenes on the road” series. I am terrified pf snakes, so wouldn’t get that close to those street performers :). And how about those guys selling water?! Those water guys were so funny. They kept offering to sell us some water but I was too afraid to drink it, they absolutely didn’t understand why. It all ended up us buying them a glass of fresh orange juice. I have never actually seen a desert but that photo is beautiful. I will pass on the snakes though! I’ve always wanted to go to Morocco! This is fabulous! I like haggling too! 🙂 At first it’s strange but once you get the hang of it, it’s like putting on a show. And I agree so much with you: Morocco is a fascinating country, still very much authentic.